Cycling is one of the fastest growing transportation modes in Toronto. The City is working to make travel by bike safer and more inviting. In 2019, the City of Toronto is proposing to install a physically separated bike lane (cycle track) along Scarlett Road from the Humber River to just north St. Clair Avenue at Bernice Crescent. The separated bike lane design will require the reduction of traffic lanes, which will reduce vehicle speeds on Scarlett Road and improve safety. The new bike lane will provide a dedicated space for cyclists, improving safety and comfort for all road users. 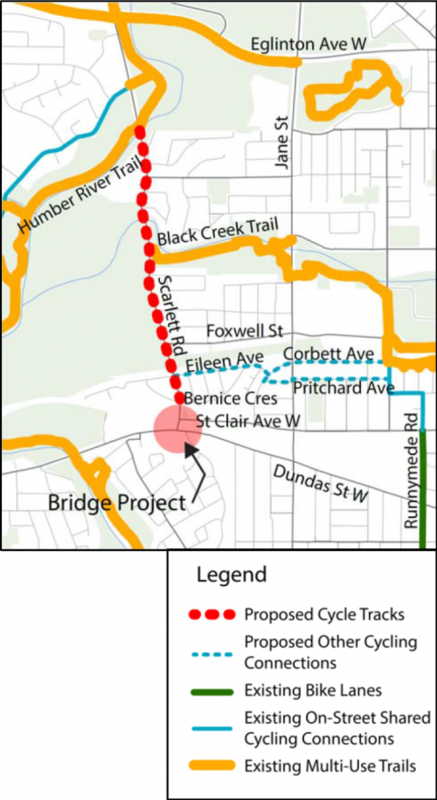 The bike lane will expand the local cycling network by connecting to the existing multi-use trail on the Humber River, at Black Creek Trail, and future bike lanes under the Scarlett Road Bridge. Options for cycling connections to Scarlett Road being considered for the future include Eileen Avenue to Pritchard Avenue or Eileen Avenue to Corbett Avenue. The installation of the separated bike lanes on each side will require a reduction in the number of motor vehicle travel lanes from four lanes, to two, plus center turning lane. The Scarlett Road bike lane separation would include short concrete walls where ever possible, bollards (short posts) and curbs in some locations, along with signs and pavement markings throughout. No stopping or parking will be permitted next to or in the bike lane. TTC bus stops will continue to function along the route. This work will be coordinated with TTC’s planned Junction Area TTC route and stop location updates. This project will also include road resurfacing and traffic signals will be optimized to keep traffic moving. The proposed lane reduction in this project would reduce the recognized road safety problem of high vehicle speeds along Scarlett Road. In support of pedestrian safety, a new traffic signal at Eileen Avenue is also proposed, which will replace the existing pedestrian crossover at Bernice Crescent. The center turn lane will make it easier and safer to turn to and from the side streets. 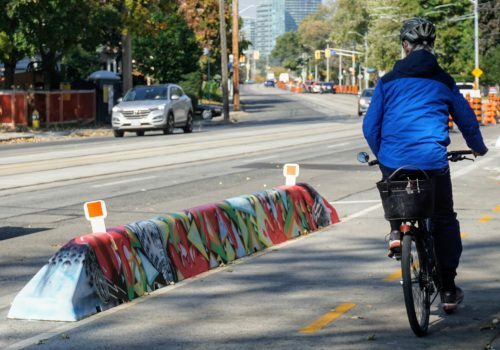 The proposed short concrete walls separating the bike lane from the traffic will be covered in painted murals through a partnership with stART Toronto. The Scarlett Road Bridge project will include public art throughout the site: in the underpass, along retaining walls, and in the parkette. Join us for an opportunity to view information materials, see a presentation, and speak with the project team. Time: Drop in 6:30 to 9 p.m.. Presentation at 7 p.m. This meeting was requested by local Councillor Frances Nunziata who will be in attendance alongside Councillor Gord Perks. Scarlett Road Bridge Update will also be presented at this April 29 meeting.